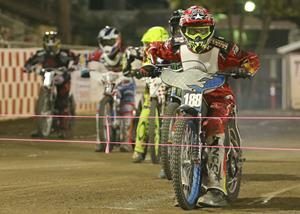 After padding his lead in the AMA National Speedway Series by 11 points after round four in Southern California, current national champion Billy Janniro continues to be a formidable force at Auburn’s Fast Fridays Motorcycle Speedway at the Gold Country Fairgrounds. In the 15th week of the Fast Friday’s season Janniro has won ten scratch main events. One week was the North vs South Challenge without a scratch main, so Janniro has won all but four scratch main events this season. 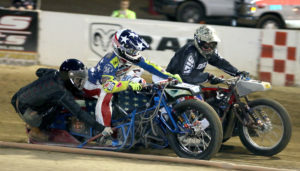 The others were won by Bart Bast (three) and Charlie Venegas (one). Last Friday night Janniro was again on his game winning his heat and semi-final races to earn a position in the final race of the evening. Janniro drew lane three, though he wins routinely from any of the four start spots. Tommy Hedden, who has been in 11 of 14 scratch mains this year was in lane one. Russell Green was in lane two and Venegas was in lane four. Again, as in weeks past Janniro got a great gate and beat everyone to turn one and took a shallow lead. Tommy Hedden was right on his tail and made it a race for three laps as it got really exciting when Janniro slid a little wide and Hedden took advantage of the mis-step closing the gap. Janniro easily recovered though and won the race. Hedden was second, Green third and Venegas fourth. Davey Shaw also clinched another win in the Division II program. You have to look back to May 25 for Shaw’s last win but Friday night he topped Sammy Tetrault who was second and Aaron Sorani who was third to stand on the winner’s podium. 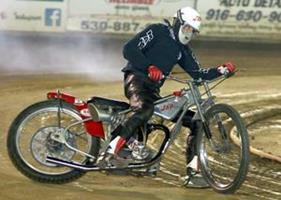 Shaw is a cousin of Ryan and Bart Bast and nephew of speedway racing legends Mike and Steve Bast. Born in Auburn he currently resides in Southern California. Shaw starts on the 30-yard line and will most likely start on the forty when he returns to Auburn. Casey Cornilsen was back on the winner’s podium with a second win in the Division III main event. Early in the season Cornilsen suffered a serious crash and took time off for a couple of weeks with serious back injuries. Friday night’s win was his second main event win of the season. Sammy Tetrault was second and Aaron Sorani was third. “Second week out I fell and fractured three vertebras, I took four weeks off to recover and then had a couple of second place finishes. Two weeks ago, I got my first main event win of the season, and tonight my second,” Cornilsen. Cornilsen starts now on the 60-yard line so look for him to make the leap to Division II when racing resumes Saturday September 1 and riding in the Division II track championships on September 22. Jake Estes was second and Jeff Powell was third. 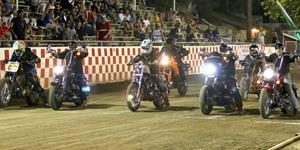 In an interesting event Fast Friday’s and Rocklin/Folsom Harley Davidson brought the Hooligan’s V Twins to Auburn’s dirt oval. 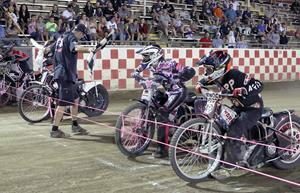 Any V twin motorcycle was eligible to enter, riders ran their bikes in a four-race program and the winner took home $200 put up by Harley Davidson for a win in the main event. Ten V Twins’ showed up for the challenge, some road bikes straight from home to the track and a couple of V Twin race bikes. Brad Spencer of Gilroy was first and Pete Demas of Sacramento was second. Cameron Krezman was first in the Youth 250cc main event. Anthony Dion was second and Landon Norton was third. Kyle Cunningham was first in the Youth 250cc consolation main event. 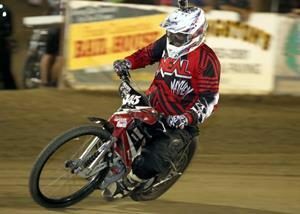 Auburn’s Colton Nelson has been on fire recently at Fast Fridays and picked up another win in the Youth 150cc main event. Nick Holbein was second and Kaytie Kangas was third. 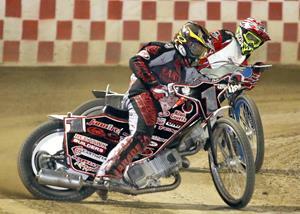 Fast Fridays shifts to Saturday night programs for the rest of the season. 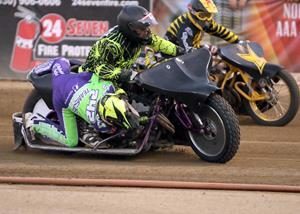 After a two-week break racing continues Saturday September 1 with the Extreme Sidecars returning for their final visit of the season. 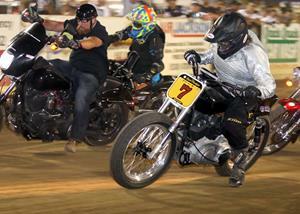 Brad Spencer of Gilroy took home the $200 prize money for winning the Hooligan’s V Twin main event. 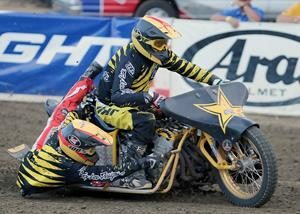 Casey Cornilsen won the Division III main event, his second of the season at Fast Fridays. Ten V twins entered the Hooligan’s program Friday night. 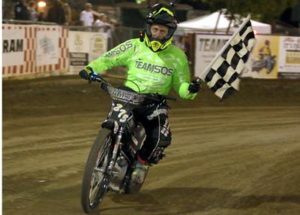 Billy Janniro picked up his tenth scratch main event win at Fast Fridays. 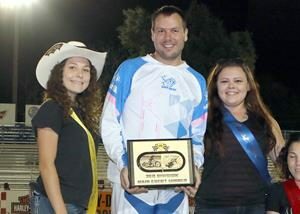 -Louie Mersaroli led the handicap main event restart to win the event for his first main event win of the Fast Fridays season. The scratch main event start. Billy Janniro (second from left) won the event, his 10th of the season at Fast Fridays.